Our new, knowledge-driven economy relies on entirely different resources: bright, educated people with bold ideas that fuel innovation — young engineering and computer science graduates armed with the technical knowledge, the business know-how, and the passion to enter the job market brimming with fresh ideas, new perspectives and a commitment to building a better future. At the School of Electrical Engineering and Computer Science, we think innovation is a state of mind. That’s why we’ve created a culture of innovation; an environment that nurtures innovative thinking to allow you to become an engineer who is able come up with creative solutions. 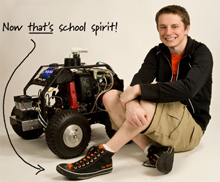 As a student, you’re able to try new things beyond the basics, whether it’s working on your TekBot, collaborating on an open source project, participating in a student club, or doing research with a professor. We believe that deeper learning and innovative thinking comes outside of the classroom, where new ideas and designs flourish.